The Trust is preparing for its first annual ‘Hoki Ora Atu Tītī /Fly Safe Hutton’s Shearwater’ event, which will be held from Friday 4 March until Sunday 3 April 2016. This month-long event will revolve around increasing awareness of Hutton’s shearwater fledglings crash landing around the Kaikoura township each breeding season, due to light disorientation and attraction. 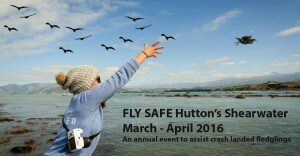 The key element of Fly Safe will be to mitigate the effect of crash landings by saving as many birds as possible, in a coordinated volunteer effort. Any bird that crash lands is unable to take-off again and remains grounded. Crash landed birds therefore die from injury, stress, starvation, dehydration and predation. All crash landed birds (dead or alive) will be collected for processing or release at the new ‘Hutton’s Hub’ located at the Kaikoura Department of Conservation office on Ludstone Street. 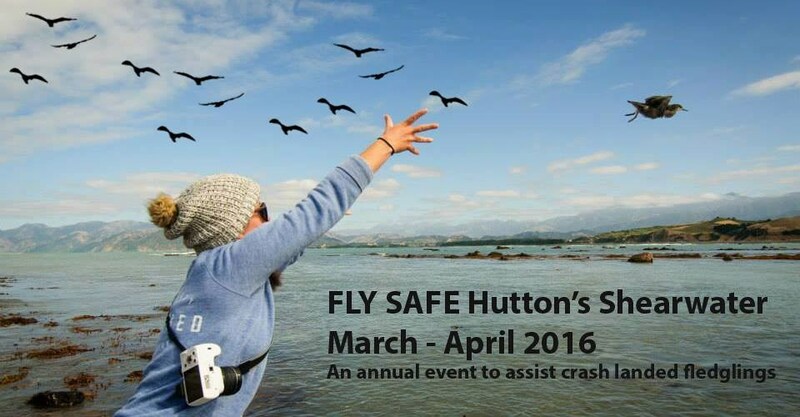 The Trust need LOTS of volunteers for the Fly Safe event held in Kaikoura as of Friday 4 March 2016 – to collect as many crash landed Hutton’s shearwater fledglings around the township as possible. Will you be in the area to help? If you live in Kaikoura, are planning to visit or pass through, or live in the Canterbury region – we want you. Crash landed birds will be collected 24/7 for a four week period from 4 March until 3 April 2016. Volunteers are predominantly needed in the evenings and at night, on weekdays and weekends. Please contact us at: admin@huttonsshearwater.org.nz if you can assist. Thank you!